Google started out as a search engine but now the company sees itself as a “growth engine” with tools and platforms that can help companies from different industries improve and develop. 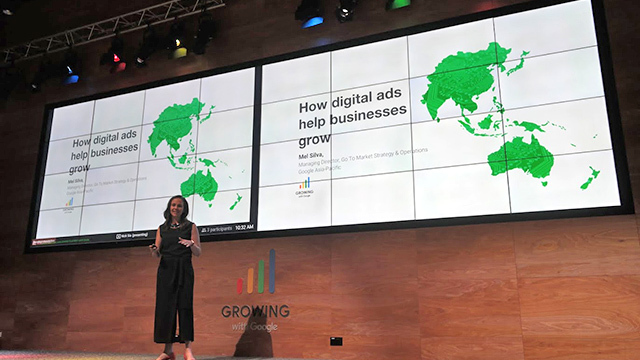 In the Growing With Google event held at the Google APAC office recently, heads of Google explained how they’ve helped small businesses, content creators, publishers, developers and big businesses reach their goal. Every business should be an online business, according to Kevin O’Kane, managing director, Google Marketing Solutions, Asia-Pacific. “All the biggest companies were once a very small business. So this is really driving the innovation. This is why we think SMEs are very important,” O’Kane said. This is vital especially to SMEs which can connect with consumers when they are looking for goods or services. To keep growing, SMEs need to meet consumers where they spend an increasing amount of their time, which is online and using their mobile phones. Mobile is already a driving trend in Asia. According to O’Kane, in Indonesia alone, the percentage of people who own a smartphone went from just 14 percent in 2013 to 60 percent in 2017. This is why one of the most basic things a business needs to do is to be found on mobile. Google My Business (GMB) offers businesses of all sizes a free presence on Google Search and Maps that businesses can customize with text, photos, and design themes. - Market Finder and Google Trends: help SMEs gauge interest for their products. - Analytics: helps SMEs understand how their site or app is performing, and which activities contribute to sales or visits. - YouTube: SMEs can use YouTube to find and engage new customers. Anyone can upload a video on YouTube for free with just a smartphone. - Test My Site: tests mobile website speed and helps SMEs improve their website performance. - Digital Garage: offers free online digital and marketing training. - Go Global: helps businesses kickstart export. One of the small businesses that has benefited from these tools is Sonicon Construction, a concrete-cutting business. Tan Guan Han, its founder and sales and marketing manager, said that having a business page gave their contractor the confidence that they could finish on time. After creating a website, they also started to run ads and now, 80 percent of their revenue comes from the leads supplied by the ads they run on Google AdWords. 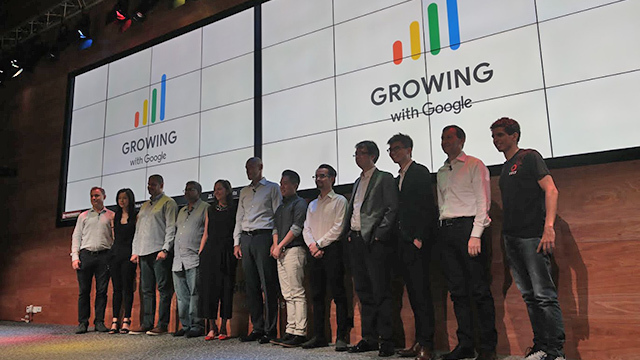 “Growing with Google, we don’t just grow in terms of business leads, revenue but it gave me a new direction in life and help the community around us,” Han said. Without content, there would be no reason to go online. Google’s business rests on partnerships and we have a responsibility to help the ecosystems we work in thrive. Creators who use YouTube can reach large audiences, turning their creativity into a business. 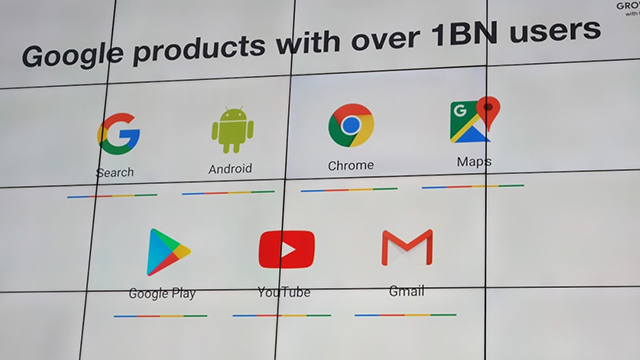 “Google has been fortunate enough to have built seven products with over a billion users—Search, Maps, Android, Play, YouTube, Chrome and Gmail," said Karim Temsamani, president of Google Asia-Pacific. "These aren’t just apps but platforms"
According to Jeremy Butteriss, managing director for global partnerships in Asia-Pacific, 1.5 billion people come to YouTube every month to view content from over 100 countries. Broadcasters and studios are using YouTube to promote and distribute their content. A group that has harnessed the power of YouTube is ClickNetwork, the first YouTube channel in Singapore to reach one million subscribers. Founder Gillian Tan said that they started as a television production company in 2003. In 2007, because of censorship concerns, they shifted to YouTube as their platform. They started with 10 staff members and they created videos about lifestyle, content, beauty, food and fashion. Now they have 1.1 million subscribers with over one million views every week. According to Tan, considering that Singapore only has 5.6 million people, it’s a huge deal. “YouTube remains at the core of our business but we have also diversified,” Tan said, whose team also ventured into offline activation events and e-commerce. Ads keep the internet the free and open place it is today. Advertising funds the services people use online every day and this includes Google’s services. 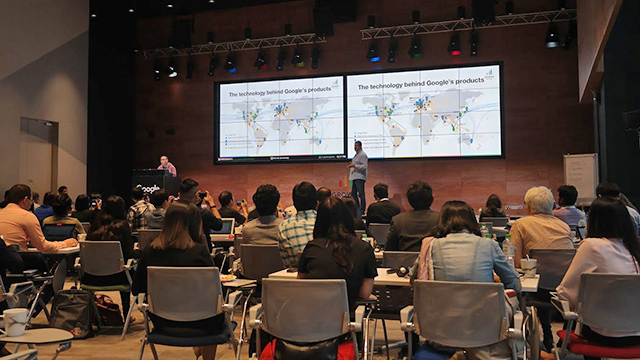 Mel Silva, managing director of go-to-market strategy and operations for Google Asia-Pacific, said that the very first Google ad was “Lively Lobsters” from Maine, which sold live, mail-order lobsters. “We need an ads ecosystem that works for everyone. Ads need to be relevant to users, they need to work, they need to be efficient to advertisers,” Silva said. - Search ads: the most efficient and effective direct response medium ever invented. Ads are shown only when consumers want them and advertisers are charged only when ads are clicked on. - Display ads: AdSense is Google’s way for publishers to join the Google Display Network and make money from their content. The technology understands a page or site’s content and matches ads to it. - AdMob: helps publishers make money from their apps with ads. “Universal App Campaigns” are used by developers to promote their apps across Google Play, Search, YouTube, and on the 3M+ sites and apps in the Google Display Network, using AI to automate when and where to show the ads. - YouTube: a wide range of ads are available on YouTube, including skippable “TrueView” ads that advertisers only pay for if watched. Besides video ads, they also run search ads in YouTube. - DoubleClick: tools for both publishers and for advertisers that analyzes billions of signals to make a split-second decisions about which ad should be placed where, at what price. Its AdExchange feature also connects these buyers and sellers. Silva told Entrepreneur Philippines that while the technology exists in other countries to measure online to offline conversion, it’s still being rolled out in Southeast Asia. For the meantime, advertisers and marketers need to focus their campaigns on a specific objective to achieve a successful ROI. A group that has converted from using TV ads to YouTube ads is Vuly, a company in Australia selling trampolines and swing sets. Founder Joe Andon told the story of how he used to sell just 100 trampolines from his bedroom. Now they’re in over 2,000 retailer stores and it’s thanks to the ads they ran with the help of Google. The company previously ran TV campaigns, spending half a million dollars a year, before trying a YouTube campaign. With just $50,000, they got a higher return on investment compared to the TV campaign. “Right now we’re manufacturing hundreds of trampoline parks around the world,” Andon happily shared. - Progressive Web Apps: enable their partners to build app-like experiences that use a fraction of the memory and processing requirements of traditional apps. - Google News: a platform for consumers to discover news and a great source of traffic for the news media. It provides news readers with more choices than ever before by bringing them content from different news publishers from around the world. - Google News Initiative: providing news partners with cutting-edge tools and capabilities to help them better understand and connect with their users, improve their products and power their underlying technological infrastructure. - Many of their partners also make money by selling ads against their content. Our global advertiser network and DoubleClick solutions help partners find suitable advertisers and generate revenues worldwide. A publication that has fully maximized these tools and platforms is the South China Morning Post. Head of Product Malcolm Ong said that their experience using Google’s tools and platforms allowed them to better deliver content and where to deliver it, whether in their app, website, YouTube page, or News Stand page. “When we are making products that people love, they have to be reliable, they have to be fast, they have to be engaging. Looking ahead to the future, we want to continue investing in products that people love,” he said. Many Asian developers, including Pinoy game makers, have found their fortune by creating apps and publishing it on Google Play. This platform helps app developers find an audience locally and worldwide. Over 82 billion apps were downloaded from Google Play between May 2016 to May 2017. That’s 11 apps for every human on Earth. - Subscriptions: They have supported subscriptions on Google Play for some time and they’re also making it easier for users to subscribe to news content. - Payments: Google Pay allows users to pay in millions of places in stores, online, apps and within Google products like YouTube, Photos and Play. Founder and CEO Jason Yeung said that in the past, they used to distribute advertising materials about their games in supermarkets and convenience stores. Fortunately, digital distribution and ad monetization means they can distribute games all over the world. An example is the use of Ad Mob and how they used it to advertise, reach global users and reduce risks before starting. The game had a whopping 120,000 downloads after its launch, 870,000 views and 20 million downloads overall. “We’re able to use very simple tools to interact with global audiences worldwide. Google Play also provides tools [that we can use] to analyze; tools we can use to develop new games without basic requisites,” he said. Google’s products, especially the Cloud, is fitting for big businesses that need a lot of space for data. However, startups and small businesses can also access these same technologies that used to only be available to large enterprises. - They save money and time on tech. They stop running infrastructure and packaged applications. - They invest in what makes them unique, such as building great products or offering a great service. - They innovate. They collaborate more and change processes, increasing team productivity and innovation. - Google offers a range of custom services from ready-to-go fully-built machine learning models from image, speech and natural language recognition and instant translation to Cloud Machine Learning for building and training their own models. One example of an Asia-Pacific brand that uses Google Cloud is Indonesia’s GO-JEK. They used the platform to support hundreds of thousands of simultaneous transactions and more than 100 million internal API calls per second while delivering average response times of 50 milliseconds. In Australia, health company Maxwell used Google Cloud Platform to create its own platform to improve prostate cancer diagnoses by analysing hundreds of thousands of prostate cancer cases using AI. More surprisingly, one business that you would never think would use Google Cloud is a textile business, but Taiwan’s HerMin Textile does exactly that. Since they have accumulated more than 100,000 kinds of fabric patterns for the past 40 years, it is time-consuming for their customers to find the right pattern or combination of fabrics. It takes 40 to 45 days to manually search for a specific pattern from HerMin’s three warehouses. If there is insufficient fabric, it has to be reproduced and that may take another three months before the order is delivered. Neil Lee of HerMin said that they use Google’s TensorFlow, which has enhanced their competitiveness by creating a fabric identification algorithm, reducing the time required to deliver orders from 1.5 to three months to two to three days. Following the introduction of machine-learning and cloud technology, the speed of bringing new fabric designs to market has also been reduced from 12 to nine months. “We also hope that this innovation can help Taiwan’s traditional textile industry to explore a new path so that we can make it more efficient and more innovative and we will have a new business model,” Lee said. Google has promised to be committed to ensure that their partners benefit from the growth of their platforms. In fact, in the last three years, the company has paid more than $24 billion to its developer, creator and publisher partners in Asia-Pacific. Officials have also pledged to be an AI (artificial intelligence)-first company because of its positive impact on people’s lives. If it’s made available to everyone, people will be equipped with the skills to thrive in the ecosystems of the future. For Karim Temsamani, president of Google Asia-Pacific, technology doesn’t just create products, it also creates ecosystems. These ecosystems present the interconnected relationships between different groups such as consumers, advertisers and partners like publishers and developers. “Google has been fortunate enough to have built seven products with over a billion users—Search, Maps, Android, Play, YouTube, Chrome and Gmail. These aren’t just apps but platforms,” he said.